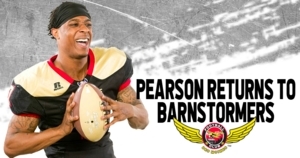 DES MOINES – The Iowa Barnstormers have signed defensive back Tyrell Pearson to the 2019 roster, Head Coach Dixie Wooten announced today. Pearson (5’10, 181, University of South Alabama) joined the Iowa Barnstormers roster in April of 2018, contributing to the team’s championship run. Pearson played an integral part in the Barnstormers United Bowl victory when he broke up the final Sioux Falls drive with just seconds remaining on the clock. Prior to joining the Barnstormers, Pearson spent time with the Green Bay Blizzard. Collegiately, Pearson spent two seasons with Mesa Community College where he collected 39 tackles, eight interceptions, and 10 pass breakups before transferring to South Alabama. In one season with the Jaguars, Pearson recorded 40 tackles, four interceptions, and 11 pass breakups.